Amy Krouse Rosenthal is a prolific picture book writer. By reading her books, you know she is someone who loves language. You also know she is someone who likes to PLAY with language. She explores words and phrases in the most inventive ways. But those words and phrases are doing something else too. They are making us smile the kinds of smiles that recognize something true. There’s a little bit of Ruth Krauss‘s understanding of a child’s mind in Krouse Rosenthal’s voice. There’s silliness. There’s smart. There’s hope. She’s collaborated with Tom Lichtenheld, with Jen Corace, with Scott Magoon. She has done projects like The Beckoning of Lovely. She’s been a guest DJ on my favorite local radio show. She is full of creativity combined with joy. Come see some of her books! Duck! Rabbit! by Amy Krouse Rosenthal & Tom Lichtenheld. In which unseen characters have an argument about what animal they’re looking at. It’s a wonderful way to play with the idea of different and many and varied visual interpretations of the same thing. 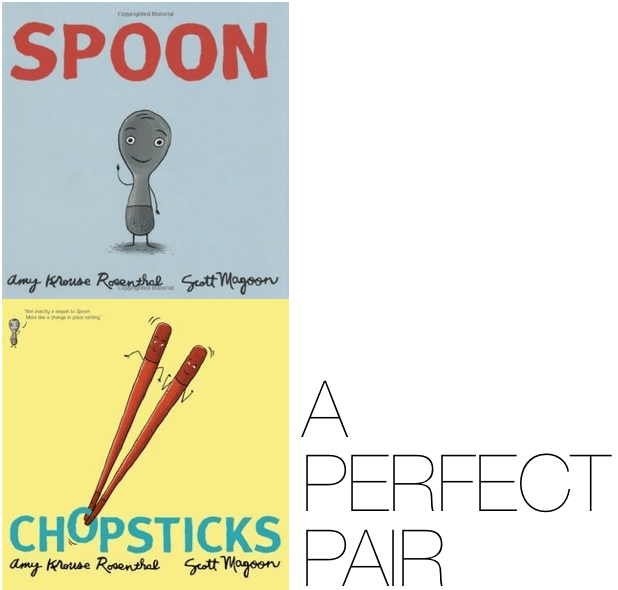 Spoon and Chopsticks by Amy Krouse Rosenthal and Scott Magoon. The first, a book about longing to be something other than what you are and discovering that being you is pretty cool. The second, a book about finding your independence in order to be an even better companion. And don’t worry, they’re both hilarious too! Little Pea, Little Oink, and Little Hoot by Amy Krouse Rosenthal, illustrated by Jen Corace. Each of these is a little animal with a problem every kid can relate to—in reverse. Little pea must finish his sweets! Little Oink must mess up his room! And Little Hoot’s greatest wish is to go to bed early. A way to play with the stuff littles have to do. I Scream, Ice Cream by Amy Krouse Rosenthal, illustrated by Serge Bloch; The OK Book and Wumbers by Amy Krouse Rosenthal, illustrated by Tom Lichtenheld. The first explores “wordles” that sound the same but mean different things. The second takes the idea of OK and makes a character out of it. The third? A gr8 book of word-number brain teasers for the math and language arts crowds. Exclamation Mark, illustrated by Tom Lichtenheld. 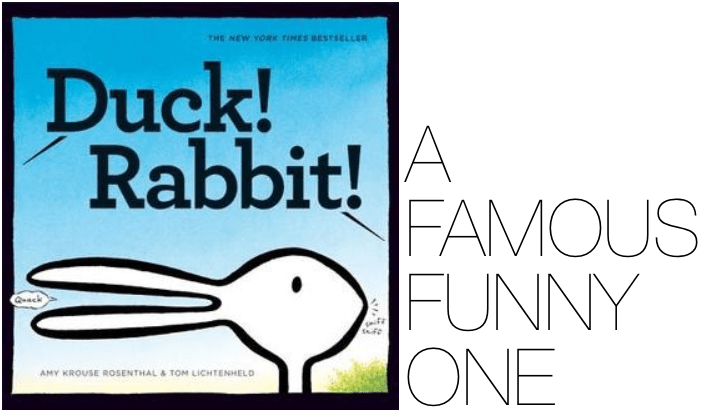 You don’t have to love punctuation to get a kick out of this smart, funny book. The real story is in finding joy in who you are. 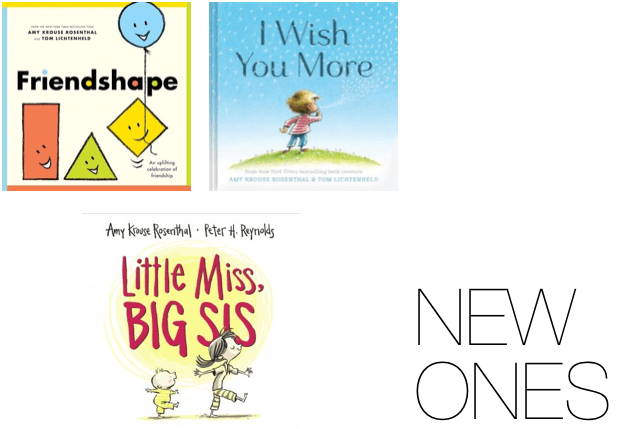 Friendshape and I Wish You More, illustrated by Tom Lichtenheld; Little Miss, Big Sis, illustrated by Peter H. Reynolds. 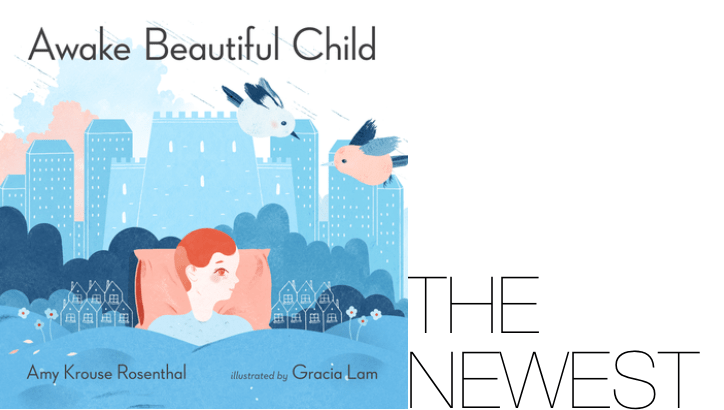 Awake Beautiful Child, illustrated by Gracia Lam. This gorgeous book, just out from McSweeney’s, is a child’s day told through A-B-C phrases only Amy Krouse Rosenthal could write and illustrated with Lam’s retro/pastel/inviting artwork. Artful Book Creation! You just have to see and read it to know how truly special it is. And as a bonus, kid readers are encouraged to hunt for all the things portrayed in the book that start with A, B, or C. Apples on the table! Cactus in the bedroom! Blocks on the floor! And like all McSweeney’s kids’ books, the jacket folds out to a large-sized poster. I’m giving away one copy of Awake Beautiful Child to celebrate AKR’s picture book life! And you might want to check out my last Their Picture Book Life featuring Taro Gomi too! Amy Kruse Rosenthal is one if my very favorites! 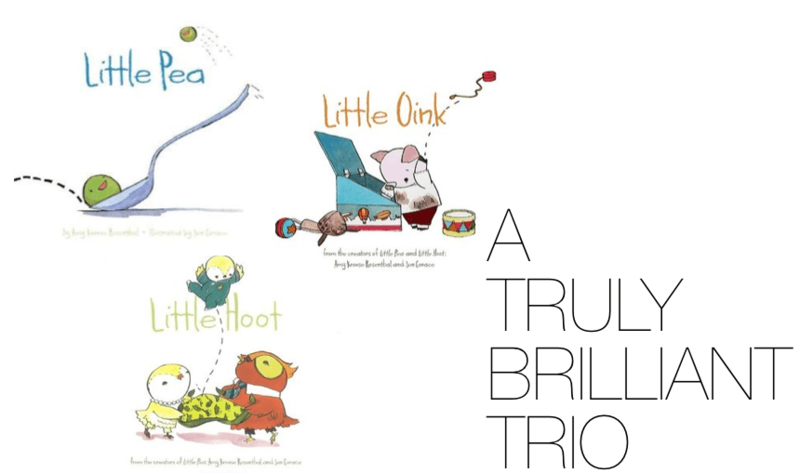 I have a soft spot for the,Little Pea/Hoot/Oink trilogy, as my babies adored them when they were small. But I also love Uni the Unicorn, Yes Day, Bedtime for Mommy, This Plus That, so many. When I grow up, I’d like to BE Amy Krouse Rosenthal. Her books are so wonderful!!! We also LOVE ‘Plant a Kiss’. My favorite is Plant A Kiss! This Plus That is fun and I love Jen Corace’s illustrations for it. Big Sis, Little Miss is such a lovely story. It has been read on repeat since it was introduced in our house this summer. Jen Corace does wonderful work. Duck Rabbit, definitely! But I also love Exclamation point–such a funny book!Thanks, Danielle! I love that series so much. Thanks for stopping by! I don’t even know how to pick a favorite AKR book, but my son loves Spoon and Chopsticks so much that we’ll just go with those! Beautiful books! I loved the post. Exclamation Mark is one of my favorites! I’ve only read Little Pea, but it’s adorable! It is! And I hope you’ll check out more of her work. It will not disappoint. I’ve read a few of these and loved them, and as I read, I added “Wumbers” and “Duck, Rabbit!” to my library holds list. Thanks for introducing all of these, and for the chance to win! I want to read Spoon and Chopsticks! Thanks for sharing about her latest one too. I’m new to Amy Krouse Rosenthal’s work but my curiosity is piqued!! The illustration on the cover of the new book caught my eye. What a great list of books! Thanks for sharing all of these. My class loves all of Amy’s books, but It’s Not Fair, Yes Day, and Friendshape were the best loved! Amy’s books are so fun and clever. I’m surprised I haven’t read them all. That is my new goal! I haven’t read them all but I do like “Spoon” and “!”. I think my email was mis-entered in my previous comment about Spoon and !. Entered correctly here. 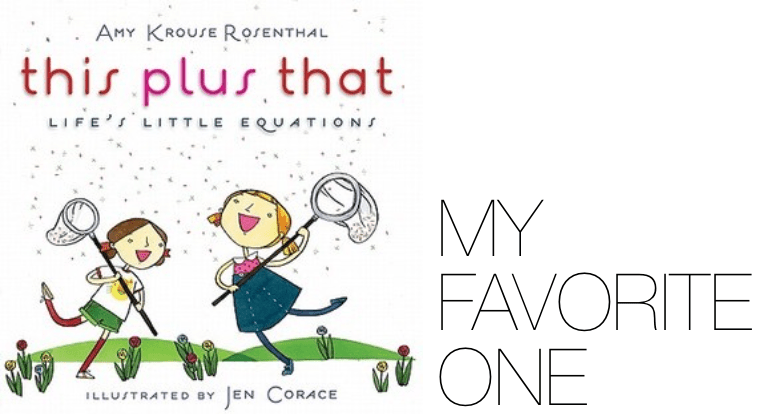 I LOVE Amy Krouse Rosenthal’s work! I own Little Pea, Little Hoot and Little Oink, Exclamation Mark, and one you didn’t mention: Plant a Kiss (prequel companion to Little Miss, Little Sis, I believe). I’ve read most of what you mentioned in this post, but I’m going to request the rest from my library right now! Amy Krouse Rosenthal is a new discovery, and I can’t wait to give This Plus That, Spoon, and Chopsticks as Christmas gifts this year. Looking forward to reading her newest book. Thanks for writing! Love her books! Friendshape and The Exclamation Point are at the top of my list! I still need to get my hands on FRIENDSHAPE! 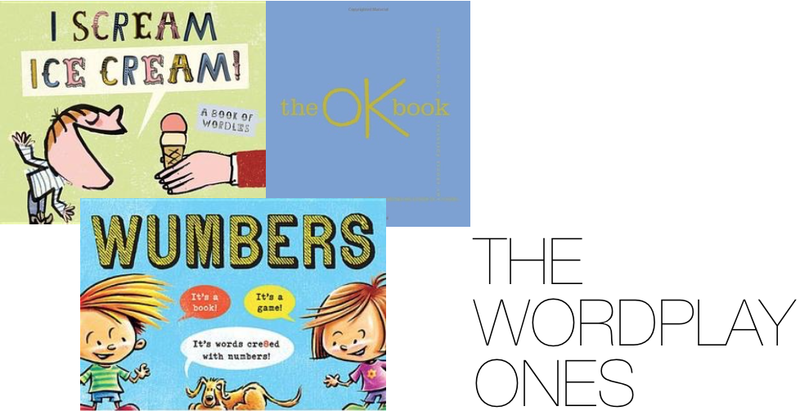 We *love* Amy Krouse Rosenthal books! I’ve read *almost* all of hers, and I think my favorites so far are This Plus That and Exclamation Mark. My kids love rereading Little Oink, Little Pea, and Little Hoot. Definitely looking forward to checking out this newest! I adore all of her books but my favorites would have to be Friendship and This Plus That. This is a new author for me. Spoon & Chopsticks look charming! My kinder-bears love Duck, Rabbit. We use it during our conflict/resolution lessons to talk about how people see situations differently and react in different ways. I love the simplicity of truth in all of the books. First time visitor to your Blog. Fun stuff here! I just read Amy’s article in today’s New York Times and learned of her advanced case of ovarian cancer. What joy she has brought to the world. What a legacy she leaves. What a loss her passing will be. Godspeed, Amy. I prayed for you. I prayed for a miracle. I hope you get one. Either way, I hope to meet you on the other side. God be with you.